The 21st Anniversary of the Stockton Children’s Book Award finally arrived. 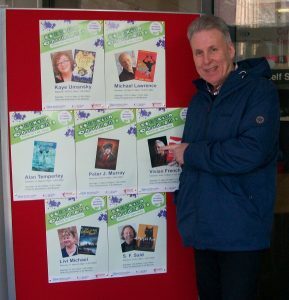 Along with 14 other authors, Kath and I headed for the Stockton Library special weekend celebrations. The library were very generous and put us up in a nearby hotel and sent a taxi to collect us to take us to the library on Sunday morning along with 7 fellow authors. The other 7 invited authors had spent the previous day (Saturday) with their fans…now it was our turn! Scabbajack was the reason for my invite. It won the award back in 2012 and it was pleasing to find out that it’s still a popular read in the Stockton schools today…despite it being very scary! Well, we had a fabulous day! As usual, Lucy Carlton-Walker had organised everything with super efficiency and our two presentations, with lunch in between, and subsequent book signings, all passed smoothly and without a hitch. Thank you so much, Lucy, and to all of the library staff for making our day so enjoyable. We loved every minute of it. The next morning found us at Tilery Primary School. We have a long-standing relationship with this lovely school and it was great to find out that they are still HUGE fans of our books. We performed our full-blown Mokee Joe presentation to a fab KS2 audience. I could have talked to them forever…and I think they would have sat there forever if we’d given them the chance! Tomorrow, our son, Simon, arrives and he is going to entertain and enthuse the KS1 pupils with his Icky Doo Dah books. Thank you Tilery Primary for inviting us back…we love visiting your school and will continue to do so as long as you keep on reading our books! Next visit was to our old friends at Conyers School. Five Year 10 boys greeted us, helped us set up in the auditorium and even managed to acquire a cup of tea for the both of us. Amazing! A big audience of Year 7’s (232) sat extremely attentively (very polite!) 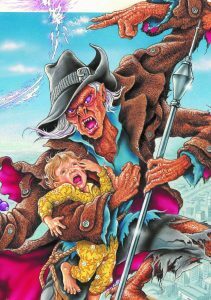 as I talked on about the reason why I was in Stockton in the first place – Scabbajack – followed by a dramatic presentation of the sequel – Kruschmeister. The performance was well-received and I thought the audience did me proud in sitting on their hard seats for an hour and a half! Phew! The following day we arrived back at Conyers in the midst a ferocious hail storm, made our way to the library and managed to sign books for a long queue of fans, chat to the lovely librarians and somehow eat our lunch at the same time. Exhausting but brilliant! BIG ‘thank you’ to Ms Dawson for being a superb hostess (as usual), and to her fab team of librarians for looking after us so well. We will be back! 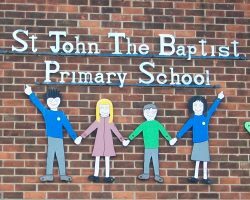 Final visit of the Stockton tour was to St John the Baptist Primary in nearby Billingham. Unfortunately it turned out that the Year 4’s were out swimming and the Year 6’s were heavily involved in SATS preparation, so our audience was restricted to Years 3 and 5. But didn’t they make up for it! All of the children were brilliant and a pleasure to perform to. 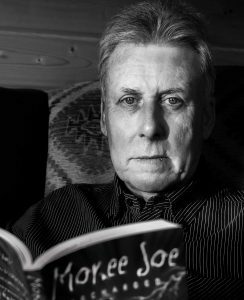 The Mokee Joe presentation went down a storm and we couldn’t get over how many of them were waiting the next day to get their hands on the books. It seemed Simon had also made an impact working with KS1 on his Icky Doo Dah books and hence the school was more than pleased with our visit. Good food with good friends! 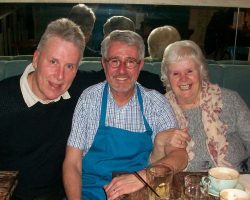 We finished off the tour with a visit to the Cenna Restaurant in Yarm to link up with a good friend of ours, Peter Huggins, alias ‘Peter Popps’ to those who know him in the area. Peter has followed us over the years since we visited his daughters’ school, Yarm Primary. His eldest daughter, Sophie, is now preparing for university, but is currently helping out in the restaurant and she actually served Kath and I with our meal. Brilliant! The meal, by the way, was excellent, and Kath will tell you that the dessert was to ‘die for’! Oh well, back to base for a well-earned rest. Just hope the snow and ice keep away so I can get some fishing in! Thanks to everyone who met up with us in the Stockton area…it was a real pleasure, as always! This post was written by peterjmurray on March 18th, 2018 5:12 pm Comments Off on BACK ON HOME GROUND! After our great week during World Book Week on the Isle of Man, it was good to be back on home ground, and especially to be in and around our roots in Doncaster and Sheffield. Put that baby down! On second thoughts…no, don’t! First stop was a new school to us, Mallard Primary, and not a million miles from our South Yorkshire base…about 15 minutes to be exact. We entertained a good-size KS2 audience for the morning, introducing them to yours truly and to the entire Mokee Joe series. I love talking about the recent final book in the series, set in Dubai, and to see their faces as I show Mokee Joe holding his hostage (a baby) at the top of the tallest building in the world, the Burj Khalifa; about to do battle with the hero of the books, Hudson Brown. All this is down the great artwork of our brilliant artist, Paul Davies. Where would we be without him! Kath and I couldn’t get over how many pupils queued to get books and posters signed on our return the following day. All credit to Ms Wilde and the staff for striving to develop a reading culture in this lovely school. We hope to stay in contact with Mallard Primary and to help in any way we can. Thanks for having us…we will be back! my author career and it was fitting to introduce them to the final book in the Mokee Joe series. But not before presenting my spooky, scary football-themed book, Kruschmeister. An all-boys audience of Years 5 and 6 were an absolute delight to entertain for an hour and a half. I was so impressed with the pic one of the teachers took of me n action – my newly updated Wikipedia author profile at the back of me and the boys in the foreground. Having said that, my pic looks a bit on the scary side! After nosing around where Kath was brought up on nearby Ecclesall Road (Ecky Road as the locals refer to it) we returned the next day to do a signing, and once more we were delighted at the number of boys queuing up to acquire books. Usual BIG ‘thank’s to Ms Birch and all of the boys and staff for making us so welcome. The complementary lunch of chicken casserole and herb dumplings was to die for! We will be back when my new book is finished (a closely guarded secret! )…and not just because we enjoyed the lunch so much! A final ‘thank you’ to both of the above schools…keep up the great work!